Wandering through the parks, it’s always fun to see the locals enjoying life in Shanghai, even on cold days like this one. Fuxing Park, one of my favorite places near where I work in Xintiendi, is always full of people but especially on Sundays. Whether flying kites, dancing, singing, reading the newspaper or playing cards, there are hordes of people having fun and socializing. 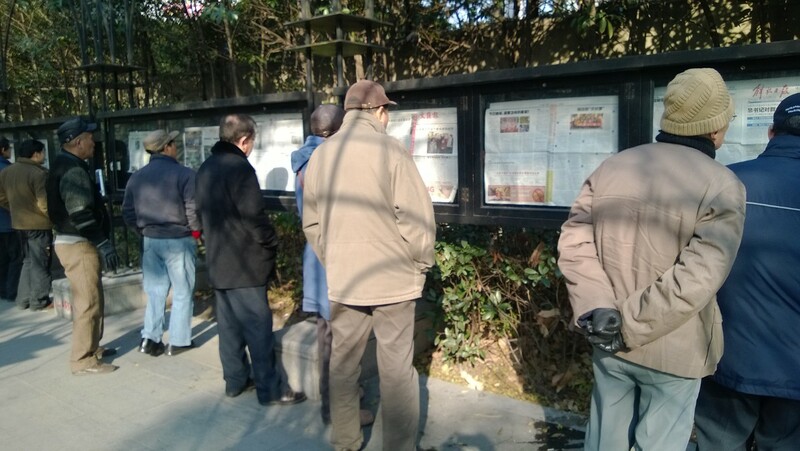 Reading the newspaper posted on boards in Fuxing Park. We didn’t see any dancing today like we have in the past which was a bummer but there was a band and singer entertaining a large crowd with their musical stylings. The sax player was performing a solo while another band member banged on the drums to set the beat. I wonder if this type of gathering is spontaneous or part of a planned program. Either way, we were part of the large crowd appreciating it all. 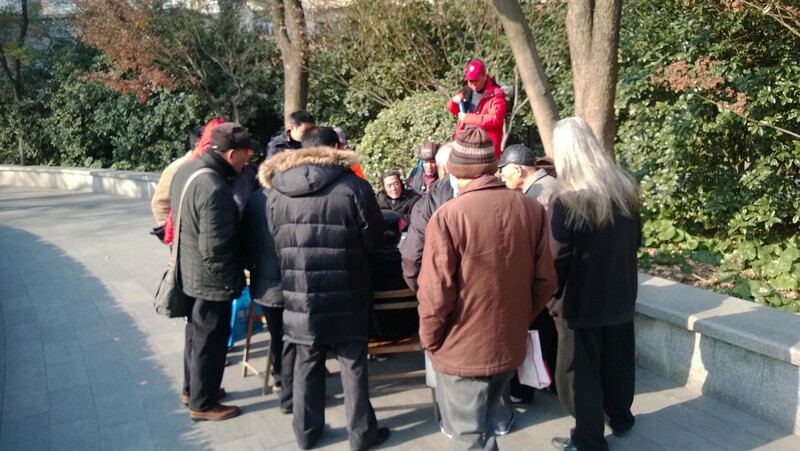 All over Shanghai, you see men playing cards (never women that I have seen so there must be some unwritten gender rules going on) and some day when I learn enough Chinese to ask, I will find out what type of card games they are playing. I have heard that here most card games involve placing wagers and gambling as well. Not sure what game they are playing but it looks intense! 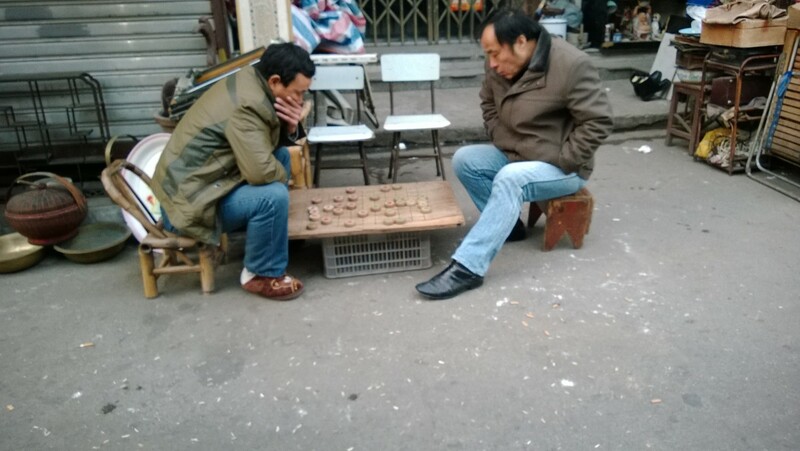 After Fuxing Park, we walked over to Dongtai Lu, where we saw some men intensely playing a checkers-like game, oblivious to the chickens running around nearby. Someone’s lunch got loose! 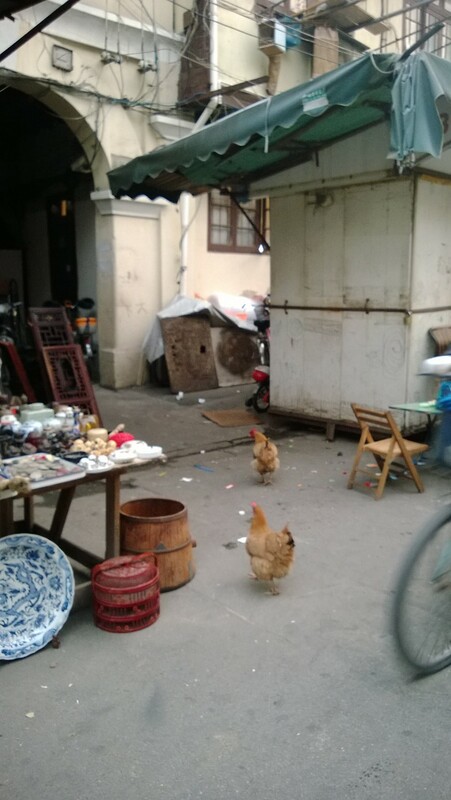 Run, chickens, run! Run for your lives–it’s lunchtime!